In Facebook, apparently I offended someone and didn't even realize it. There is so much on my plate, so let me spell out for my readers some of the things going on with me to give you a better perspective. I wish there was an easy solution, but that's not where I am now. At the beginning of last year, I retired from my day job, a senior level mechanical engineer at a Fortune 100 company. I got paid reasonably well, and the physical conditions of my job were pretty comfortable. As a Christian, and I know Christians these days often have a bad rap or it's distorted by the media or by even people you know. I will do my best to be as transparent as possible without compromising who I am, my safety or that of my family. I'd been investing and trading on/off since the mid-90s with success. 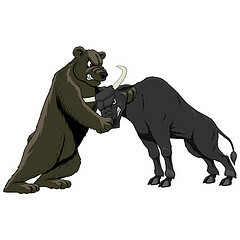 Of course, the expression, "Don't confuse brains with a bull market" so applied in my case. After a series of very successful lucrative trades, thinking I was such a hot shot, listening to my broker, I lost most of it when the market began to tank in the 2001ish timeframe. In 2003, began rebuilding the accounts, inspite of the fear that was present. Got a bit more knowledge and went at it again. No clue of risk management, skills, etc. Just basically had knowledge and that was dangerous. Lost it all again. By 2005, I had a major traumatic experience that made me re-evaluate life, my purpose and I decided I was no longer just going to keep making money just to lose it all. Decided to get some formal trading education, and thus I did so starting Sep'05 with BT (the company will remain anonymous for the sake of this, but I'm sure I've mentioned them before somewhere in my blog). I poured my hard-earned money, which was tens of thousands of dollars in the next 1.5 yrs into BT training, their subscriptions, their software & tools, DVDs. Though I had a lot of success, made a lot during that timeframe, my risk management was still not all that great. There were many lessons to learn that I either didn't hear them or they were not taught to me. Nevertheless, it's been a challenging road. As I said earlier in 2005, I had a traumatic thing happen to me that involved police. The police in the first quarter of 2006 dropped my case, which sent me into a depression. Within a few weeks, I experienced the deaths of 3 different people super close to me. That, combined with extensive traveling for these trading classes, working full time at my engineering job, raising 2 young kids with my husband was just too much for me. I ended up having a mental and physical breakdown that put me on medical leave from my engineering job for 4 months. During that 4 months, I did not travel. My trading had to be put on hold, but I did attempt to trade. My medical leave stipulated that I had to be medicated and under psychiatric care, which, as a person that is into natural living, alternative health/medical practices, this did not bode well with me, but I complied. The anti-depressants were simply horrible, giving me terrible nightmares, lots of physical and mental side effects that I would not wish on my worst enemy. Well, after all that was over, I returned back to work, got off the meds, but realized I was not suited to be an engineer any longer. I had lived under extreme stress for many years and never knew it until there was something to compare it to. Well before any of this happened, for years I prayed for what I would do after engineering. Little did I understand my breakdown was all a part of the plan to get me to recognize I was quickly killing myself with the workaholic lifestyle I had grown accustomed to. Technically, I left my job in December as I took all my vacation before my actual last day of work, where I just turned in everything. That was in Jan'07. My husband said it was fine for me to leave my job/career, and though I was the major breadwinner, he said he would be there for the kids and I, supporting us financially (means he would go out to get a job) until my trading was good enough to sustain itself. I was not ready to financially give up my day job as I was not consistently making the money I felt we needed, or saved up enough, but at the prompting of the Holy Spirit with numerous confirmations up until the point of life/death situation, that was when I submitted to the Lord. Yes, it does sound hokey, doesn't it? The first couple months I was basically decompressing. I was not on any meds except for my heart condition and enjoyed just not having to be tied to a job/career that I hated. It was during this time that the Holy Spirit began to reveal things in my marriage that were not right. Shortly thereafter, more things unraveled themselves. To make a very long story short, I found out my husband was having an affair with another woman and by Father's Day 2007, he had walked out on the kids and I. At the time, the kids were 6 and 3 yrs old. This was the man I poured my heart and energies into, believing the dreams God had for our lives, our family. Nearly every day I laid hands on this man praying for God to protect Him, mold him into the man of God I knew he could be. But, my husband determined in his heart from what I now gather, that he didn't love me and subtly throughout our marriage, found excuses to chip away at the very fiber. See, God gives everyone freewill, and though I was praying for my husband, he was in direct rebellion and gave way to Satan's lies in his life. Anyway, in July the tax government (we know who they are) came a knocking telling me that my husband failed to file our taxes from 2002-2005. During all my working career, I'd always paid taxes, but I didn't know he wasn't doing this -- filing, that is. Well, imagine how a small amount that could've been owed with interest and penalties? Not good. And, on top of that, my husband had done a number of things (or not) that really put us in financial ruins. He walked away from all of this leaving me to deal with everything alone, including raising our 2 children alone. Here I was about to start on my trading business full-time and the shock to my system. As those of you who are full-time traders, THAT in it of itself is a challenge, but now heap on a marriage mess, learning to be a single parent of young kids who very much need you, tax mess, financial mess, much less any emotional stuff that I could be dealing with, that is a lot on my plate. So, all these months, one thing by one thing as I deal with this divorce where it's been financially draining. I'm not going to go into all the gory details of that, because they are gory. But, the one thing I can attest to is the goodness of God. He has provided every single day for the kids and I. It sometimes it through others, through different things, etc. It has been amazing. I've learned a lot in my trading and it has been very challenging to juggle all these things. I'm learning that through Christ, I am strong. So, how did I offend and upset someone? Apparently this person emailed and IM'd me. I was honestly not aware of the IMs. He did email me in Facebook and I thought I emailed back or said that I'm going through a lot of stuff and that I'm not always able to email so quickly back. There has been a lot of work to deal with my divorce. As I recently took on a new trading coach, there is a lot of work there. And, being a mommy to my 7 yr old daughter and 4 yr old son, who are smart & energetic, a lot of my time is devoted to them. Their father up and leaving, rarely spending time with them, DOES impact them negatively and I have to contend with the consequences of this which has been a number of things. There are emotions, actions, etc. And, I'm not a child therapist, rather a retired engineer with no psychological training. And, to also deal with my emotions of having my husband leave me for some woman old enough to be my grandmother. I'm thinking to leave me for what he left me for, he must be blind and dumb. But, it really doesn't matter because what I've come to realize it's his problem. Okay, maybe some of what I wrote wasn't called for. The point is, I have a lot on my plate. If I forget to return an email or respond to everything someone wrote me or just totally forget to respond to a comment, it's not done to be mean, hurtful or offensive. There is so much on my plate. I have to contend with my own emotions, my kids, manage our household, my trading business, go through this hell of a divorce & custody battle, deal with some of the insanity of my soon-to-be ex, rebuild my trading accounts, sort through the tax mess, sort through all the financial burdens and crap he left me with, and maintain good health, teach Sunday School, blah, blah, blah. If emails are really long and filled with lots of stuff, I wish I could help you champion things, but right now I don't totally have a grasp of all my stuff let alone someone else's stuff. Do I know what I'm doing? Sometimes. One day at a time. This blog IS a journey of my trading. And, the stuff I'm going through in my personal life does impact my trading. Maybe others can just set it all aside. That's not me. But, I am stronger and better now than I was a year ago. A year from now, I'll be better. Anyway, I'm really sorry that person felt I was against him, ignoring him. I have to put my kids first and providing for them. I would love to answer all the emails I get and give them lengthy detailed discussions, but it's just not possible. Maybe in the future. Anyway, the person blocked me in Facebook and I do feel bad that this person's perception of me is totally wrong. I have not an ounce of ill will towards the person. I don't even have ill will towards my soon-to-be ex. Well, I've been writing this for sometime as I've been helping my daughter with her math homework that is greatly challenging her. Helping your children mature and take hold of their emotions, but to learn to work things out, see things as opportunities is not always the easiest. There is that innate part of me that wants to be harsh, because that's how I was brought up, but recognizing that isn't healthy, and creatively and quickly figuring out a way to encourage her to rise up to be her best. My kids don't come with their unique instruction book.